The Leatherback Sea Turtle has been on the earth for about 110,000,000 years. The species survived the meteor collision which extinguished the dinosaurs. This fascinating creature is a cold-blooded reptile, yet travels nearly all the oceans of the world. It evolved a means to limit circulation to its limbs in order to conserve body warmth. It can dive very deep and feed in waters down to 40 degrees F, which greatly increases its range. The Leatherback Sea Turtle is critically endangered, as are all 7 species of sea turtle, due to predation by humans. The stealing of eggs from nests and the destruction of nesting beaches due to beachfront development has severely crippled the chances of survival of sea turtles. They are collateral damage in the fishing industry–caught and drowned in the nets of shrimpers and long-line fishing boats. Leatherback populations in the Pacific are crashing because nearly all the nesting beaches have been built up. But, Leatherback populations in the Atlantic appear to be increasing. This is due to greater use of Turtle Exclusion Devices in the large nets on Shrimpers in Atlantic and Gulf waters, plus protection of nesting beaches and nests. The coast of Florida is one of the main Atlantic nesting areas for Leatherbacks. Floridians have met the challenge to protect the turtles by turning off beachfront lights at night during nesting and hatching season so the hatchlings can find their way to the ocean. Bravo! I read a hopeful book, Voyage of the Turtle, by Carl Safina. Dr. Safina travelled all over the world to meet with Leatherback Sea Turtle advocate organizations and determined that the preservation of nesting beaches and the nests themselves was absolutely key to the preservation of the species. Their chances of survival are slim without this protection. I was pleased to read of a cadre of scientists and volunteers all over the world who are working tirelessly to monitor and protect Leatherbacks. It is not often that one reads good news about endangered species. I am donating a percentage of the purchase price of “The Last Dinosaur” to The Fauna and Flora Society which protects Leatherback nests and nesting sites in an effort to help save them from extinction. 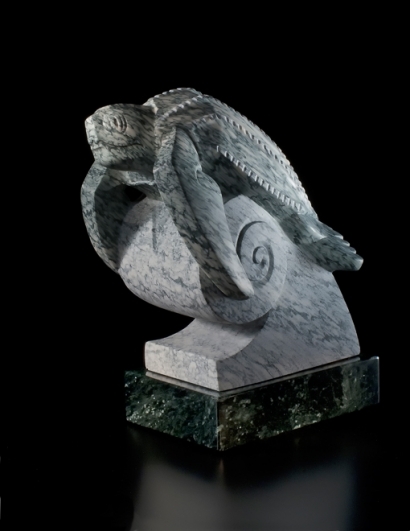 I hope this stone sculpture can contribute to the preservation of leatherback sea turtles.